Russia is one of the heaviest smoking countries in the world. While 39 percent of Russians smoke, the figure rises to 60 percent among Russian men (for comparison, the figure is about 21 percent for both sexes in the UK). Russian attitudes and laws on smoking have been incredibly lax when compared to the rest of Europe. Russians have been free to feed their nicotine addictions not only in bars, restaurants and cafes, but in schools, hospitals, many forms of public transport, government buildings and apartment complexes. Adverts for cigarettes decorate the nation’s street corners and metro systems, and fill the pages of Russian publications. Taxes on cigarettes are negligible and a pack of Marlboro can be purchased for less than two dollars, with domestic brands available for half that. The Russian government aims to change this and, on Saturday, June 1, 2013, it instituted a new law “On the Protection of the Health of Citizens from the Effects of Passive Tabacco Smoke and the Consequences of Tabacco Consumption” [ru], banning smoking in government buildings, educational facilities, healthcare facilities, the lifts and corridors of apartment complexes, train stations, and inside most trains. The law also mandates tough restrictions on tobacco advertizing, increases taxes on the smoking industry, raises penalties for sales to minors, and paves the way to a phased introduction of similar bans in shops, cafes, bars, and restaurants. 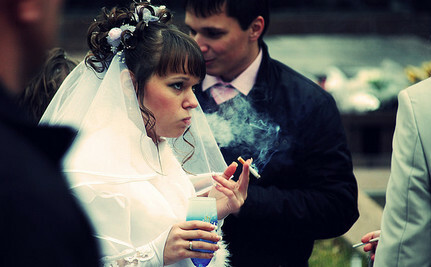 Back in October 2012, Prime Minister Dmitri Medvedev himself used his blog to disseminate a video explaining the government’s reasons for introducing such a law, noting that Russia’s smoking rate was abnormally high (comparable only to China’s) and that, since the 1990s, the percentage of Russian women who smoke had risen from 7 to 22 percent, while the age at which a person first smoked on average had fallen from 15 to 11. While official figures [ru] state that between 70 and 80 percent of the population supports these new measures, the law has proved controversial on the Russian blogosphere, where many took issue with it for a variety of reasons. Blogger Nicolai Troitsky (pictured in his LiveJournal profile enjoying a cigarette) claimed that he was joining the recently established “Common Russian Movement for the Rights of Smokers” [ru]. Troitsky denounced the legislation in the strongest possible terms in his post, “Stop the Genocide Against Smokers!” [ru]. This totalitarian, gestapo-like, fascist fight with smokers is more like an extermination, a genocide, running counter to all norms of common sense. An entire group of citizens is having its basic rights violated. The habit is strong, of course. Not just the smokers’ nicotine habit, but also our common habit of seeing people around us with smoking white paper sticks in their mouths. We need to make it so that the sight of a person smoking in front of people will bring the same reaction as the sight of a drug addict “shooting up” in front of people. After all, they are one and the same. Lebedev, a member of the ultra-nationalist political party LDPR, also underlined that “smoking is not a Russian tradition—the habit was introduced by Peter the Great” (that is, 300 years ago). The more liberal Anton Nossik criticized the law on the grounds that the coercive measures contained in the laws would prove fruitless [ru]. In any country where they’ve achieved an apreciable success in the fight against smoking, we see the massive spectre of efforts centered namely on helping smokers to quit… But where the direction of the work is forceful, even the harshest, most repressive measures don’t help. We recently discussed [on Nossik's blog] the example of France’s repressive measures, the results of which between 2000 and 2010 turned out to be nothing. And the British program of helping smokers in the same period lowered the number of those suffering [nicotine] dependence by one-and-half times. Between the carriages on the train, two ticket inspectors were smoking, blowing their smoke at the “No Smoking” sign. They were discussing the anti-tabacco law. I don’t see the point of this law. For all the controversy, Russia’s new smoking laws are broadly similar to legislation most Western countries have had for over 20 years (not coincidentally, its smoking rates are similar to those of countries like the UK 30 years ago). With 400,000 Russians dying from smoking-related illnesses every year, the government has a huge incentive to increase public health and implement anti-smoking legislation, but whether Russia’s population is willing to obey or its police are ready to enforce such legislation remains to be seen. This post was originally published by Global Voices. The problem with smoking is people who smoke near you and don't even ask if it bothers you (or get upset when you say that yes, it bothers you). Do whatever you want with your lungs, just don't let me go in apnea walking in streets .__. I hate smoking. It's really bad for your health and leads to other health problems. Thanks for providing the informative article. Giving up smoking is the best thing one can do to improve one's health and boost longevity.